He is calling on bloggers to display a "Say No to MSN Spaces" button on their blogs. 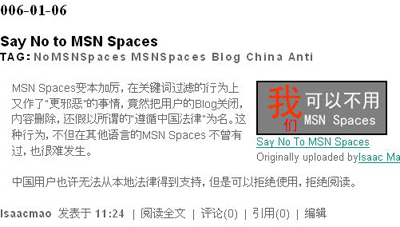 He writes that not only is MSN Spaces filtering politically sensitive key words, but has taken the "even more evil" step of shutting down user blogs, with the justification of "respecting Chinese law." Isaac writes: "This has not happened to other languages on MSN Spaces, and is unlikely to." He then continues: "Chinese users may not be able to get support from our own domestic legal system, but we can refuse to use them and refuse to read them." He posted this just minutes after I updated my latest, detailed post with lots of Chinese blogger reaction to MSN censorship. There's some pretty thought-provoking stuff. As long as there are clear rules, they can be circumvented and bent. 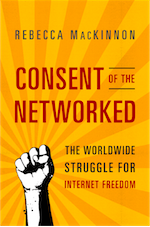 People can, and do discuss things using vague historical allusions, use anti-blocking software, or post overseas. Also, as long as there are clear rules, you can try challenging them softly, and move the rules back bit by bit. Fine, the CCP doesn't want people to talk about overthrowing the Party, so let's not. Instead, let's talk about things that are on the borderline and push these borders back bit by bit. Finally, as long as there are clear rules, we can make sure that we aren't imposing restrictions any more than are absolutely required to do business. The Chinese government knows who Michael Anti is and where he lives. There's nothing keeping them from just arresting him, if they think he is a serious enough threat. The fact that they haven't puts a damper on the "laws and regulations" excuse. The problem I have with this situation is that no one has mentioned which law or regulation has been violated. No one has mentioned exactly why MSN pulled down Anti's site. No one has mentioned on whose authority these actions were done, and most egregiously, these actions impact the flow of information outside of China. I don't think that it is useful to ask anyone to be a hero, since it just causes the discussion to bring up difficult issues that are unnecessary to resolve in this case. No heroics. Just some clarity and transparency. This is just making it to the the NYTimes news !! In a totalitarian state? "Shirley, you jest." So, MS does what they are told by the rulers of that country, and they get to continue to lose money in the land of the PLA. If they do not, they go out of business, and whomever is using their (free) service lose their access and whatever voice that this vehicle provided. Hmm. Doesn't take a lot of thought to determine the more honorable course of action. The complaint isn't with any (non-state owned) company. It's with the (non-elected and therefore unaccountable) leadership of that state. No accountability, no rule-of-law. I don't mean to defend what MS Space has done to M. Anti regarding his free blog space. But from someone who has been living inside China for more than 5 years, I do "understand" there is the need for MS Space to pull down Anti's blog if they don't want to offend someone and if they want to carry on with their business. We have all heard news about the incaceration of serveral Chinese laywers simply because of their involvement in certain high profile cases. We have also read about the house arrests of some activitists, including some blind man for trying to expose the darkness. Are all those heavy-hand activities from the high up legal from the perspective of Chinese law? Hell, no! Nevertheless, they just happened and are happening and will happen, and nothing you can do about them. Not even with Microsoft! How is it that Isaac Mao's page is now apparently blocked according to the blurb one gets after clicking the link to his protest above? "NOT ISAACMAO.COM isaac's backup page. if you were redirected from accessing isaacmao.com, it means the isaacmao.com is still being blocked"